Do you have a pet? We love our pets and we’re sure you love yours. But, we don’t like them too much when they have accidents in the house. Do you need help with pet stain or odor removal in Birmingham AL. 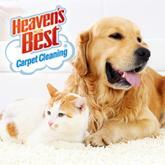 Heaven’s Best Carpet & Rug Cleaners can help. The stains and odors associated with our furry friends can be a minor irritation to a major problem if they continue to go in the same spot. You may have even taken your pet to training classes to break them of their bad habits. That does not guarantee your pet won’t have an accident. Even if you are a good housekeeper and you clean regularly, stinky pets can cause havoc. A house that smells of a pet does not necessarily indicate bad housekeeping, but it can be embarrassing. And after living with the smell for a while, you become accustomed to it and you don’t even realize how bad it may smell. So, stinky pets can be a problem if you are having guests over. And add to that, the fact that dogs and cats spend a lot of time laying and rolling around on the floor. Their body odors can permeate into the fibers of your carpet and upholstery. If Spot decides to lift his leg on the corner of your table or chair, it is not going to be a pleasant experience for you dinner guest. The smell of pet accidents can be unpleasant at the least and well… your house can start to smell a bit gamey. Heaven’s Best Carpet & Rug Cleaners have an entire arsenal of advanced pet friendly cleaning products to handle even the toughest pet problems. Our dedicated team of IICRC cleaning experts also has the equipment and tools to tackle most every situation. 1. Locate contaminated areas utilizing a black light and moisture probes. 2. Extract the urine and salts, and clean the affected areas. 3. Utilize state of the art chemistry to remove stains, neutralize and dissolve urine salts. Enzymes may also be used at the molecular level to consume and neutralize all odor causing contaminates. 4. Deodorize with extra strong pet deodorizers to help eliminate the pet odor. Call Heaven’s Best Carpet & Rug Cleaners at (205) 618-9150 for pet stain and odor removal in Birmingham AL.